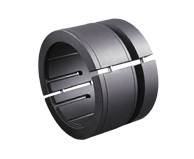 Construction: FLOW PRO™ bushing: Standard material carbon graphite-filled PTFE. Optional materials: Stainless Steel 304SS, 316SS and 17-4PH SS Bearing Bronze and Aluminum Bronze Alloy 954. Extends equipment life by protecting sleeve (non contact) and isolates packing from media attack. Eliminates packing extruded into the process. Reduces number of packing rings and includes integral lantern ring – never lose lantern ring position again! Harmful solids and particulate are contained from entering the stuffing box as the flush water is forced by the FLOW PRO bushings’ unique design (integral tangential multi-porting) toward the pumped media utilizing the shaft’s rotation and centrifugal forces that are created; allows small amount to lubricate the compression packing. Easily retrofitted into existing stuffing boxes typically with no equipment modification required.